Watching the Red Sox lose 10 straight games and you have to ask yourself, is that sound in the background the flushing of a season down the toilet? Before we say that all is lost, let's take a look at the numbers and gain a bit of perspective to back up such a claim. We will start with some pitching numbers, then look at fielding, before finishing up with hitting. This year the Red Sox have no doubt been having a lot of disappointment around the performance of their starting rotation. Their combined team ERA has them now ranked 17 of the 30 teams in Major League baseball. They are listed 29th when we look at pitching staffs that have posted shutouts (allowing no runs), and are allowing opposing hitters a .266 AVG making them 4th worst in the league. While they are 9th in the league on the strikeout list, they are also the 12th worst in giving up runs to opposing teams. 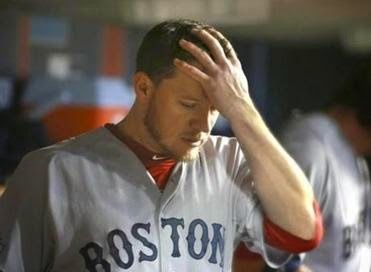 What do they look like when ranked against the AL East opponents? This list is almost in perfect reverse order of the current standings, so what does that tell us about team ERA in relation to how you play? This list is about keeping your opponents from hitting and getting on base. Between parentheses is the team ranking against the entire league. This list shows which teams have allowed the most runs to be scored, with their league rankings between parentheses. What does this all mean for the Red Sox? If you notice the division leading Blue Jays have allowed the most runs, and are in the middle on allowing opposing hitters to succeed, so you can expect they will be scoring more runs than they are giving away. The Red Sox pitchers have the worst ERA, are second at giving the opposing hitters a chance to work their magic, and are allowing runs to be scored. The problem seems to be that they can't score runs. They have lost 10 games in a row, five of these were lost with a single run, six of them on less than two runs. If they had won just five of those games, they would be in third place in the division and just 2.5 games off the leaders, instead of in last place and 8.0 games back. There has been some noise of late that errors were a major factor to the problems the Red Sox were having and might even have led to the quick hiring of Stephen Drew. It turns out that the Red Sox are the 11th worst team on the list for errors in the league and also 20th for fielding percentage. They have gotten significantly worse from last season where they were ranked 23rd worst in errors and 8th in fielding percentage. This list is of the teams in order of most errors in the division with ranking between parentheses. This list shows who has the best fielding behind their pitchers in the division and their position in relation to the rest of the league. Good defense will keep the opponent from scoring runs, so you find both the Blue Jays and Orioles are top of the heap here and it's reflected in the division standings. The Red Sox are far off the pace with the rest of their division, so along with pitching that is not shutting down hitters, the fielding is allowing runs to be scored. They need to be good hitters to compensate for these deficiencies. The Red Sox need to hit and score a lot of runs to make up for the lack of pitching and deprecation of fielding skills this year. So far it has not looked like the run scoring machine from last year has been active at all. Maybe due to injuries, but maybe also due to the youth added to the key positions of third base, shortstop, and center field. They are 24th in team batting average, 19th in RBI's, 12th in OBP, and 24th again in slugging percentage (hitting with runners in scoring position). This list shows which teams are hitting and getting on base with league rankings between parentheses. The teams ranked by most RBI's this season with league ranking between parentheses. This list shows which teams are getting runners on base with league rankings between parentheses. This list shows who is getting runners home when given the chance, with again league rankings between parentheses. It boils down here to the Blue Jays leading the division as when all is said and done, they put men on base consistently and knock them in consistently to score a lot of runs. The Red Sox have issues across the spectrum of pitching, hitting, and fielding... but it could and would all be fixed quickly by effective, consistent, and timely hitting. Looking at current players with over 100 at-bats and still hitting sub-.200, it is time for the Red Sox to take action on the both Grady Sizemore and Jackie Bradley Jr. with both hitting .197. Will Middlebrooks is a close second on this list but has only 71 at-bats with a .197 AVG to show for it. Time to give up on the Grady Sizemore experiment? Who will fix the leak in the batting order and fill the defensive shoes of Jackie Bradley Jr.?